Forgiveness is a topic that I have heard much about in the recent weeks. It has really been laying heavy on my heart and led me to some deep thinking. Dealing with a loss is tough. There is no owner’s manual on what healthy grief looks like and no one can discredit what it looks like for you. It’s a personal journey. On days where you are feeling angry, which is likely many, people will hurt you. They don’t always intend to, sometimes they do, but often they don’t. Just like there is no owner’s manual on grieving a loss of a child, there is no manual on how to be there for a friend or family member that has lost a child. Miscarriages are even more unique than that, because they only physically can happen to women. So unless someone is a woman that has had a miscarriage (which is a lot of women, but not ALL), chances are they will not be able to fully understand what to say, what not to say, or even how to look at you. Many times it feels like my wound has healed, though the scab is fresh and new, it has somewhat healed. Then someone comes along and says something all wrong, or you see someone with a baby bump, or an infant, and it’s like they came up to you and ripped off that scab and you have this gaping wound again. For a while I didn’t want to forgive these people. I felt they had wronged me and that if I forgave them, they were getting away with it. Why should I forgive someone that didn’t even think they did something wrong? They don’t deserve me to be kind to them, they aren’t going through what I am. It’s very easy to feel like every other woman in their fertile years is the enemy. I didn’t want to let that go, I felt entitled to my resentment. I didn’t want to forgive, but yet the topic just kept coming up. It took me a long while, but eventually I heard God loud and clear: LET IT GO. There are many biblical stories of forgiveness, but my favorite is about Jesus. To say that He forgave a lot of people is putting it rather lightly, but he did. He forgave people that had physically, emotionally, and mentally tortured him. In his last agonizing moments, he asked God to “Forgive them, for they do not know what they are doing” (Luke 23:34). These people did horrible, horrible things and felt justified. They didn’t feel remorse or seem to question if what they were doing it right, and they certainly did not ask for forgiveness. But he gave it to them anyways. He forgives me daily for all of my shortcomings, so what would I be if I didn’t pass that on? I’d be missing the whole point. There were some people that I was, and am still at times, so disappointed in. They didn’t handle this situation the way I wanted them to. Why weren’t they calling me? Why weren’t they there for me? Don’t they know this is HARD? At the end of the day, I just have to let it go. 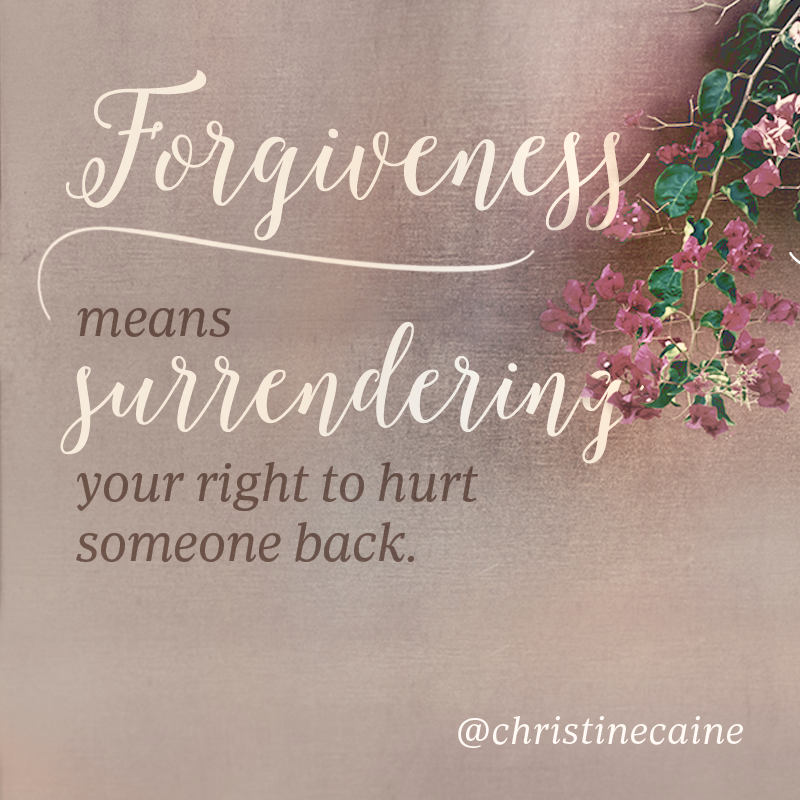 God calls us to forgive others so that we can enjoy life abundantly. It is impossible to truly enjoy my life when I’m carrying around a bag of grudges with me. And I had a really big bag. I’m not trying to say that I’m 100% healed and come see how great I’m doing, but I feel that this was a huge step in my path to healing. When I can feel myself holding on to a grudge, and feel so entitled to do so, I remind myself that God has called us to forgive others 70 x 7 times and I just haven’t reached that number yet.